Wow! In our 12+ years of running Rewards Canada I don't think we've ever come across a bonus this big from Aeroplan. One Million bonus Aeroplan Miles, that's right a one with six zeros after it. 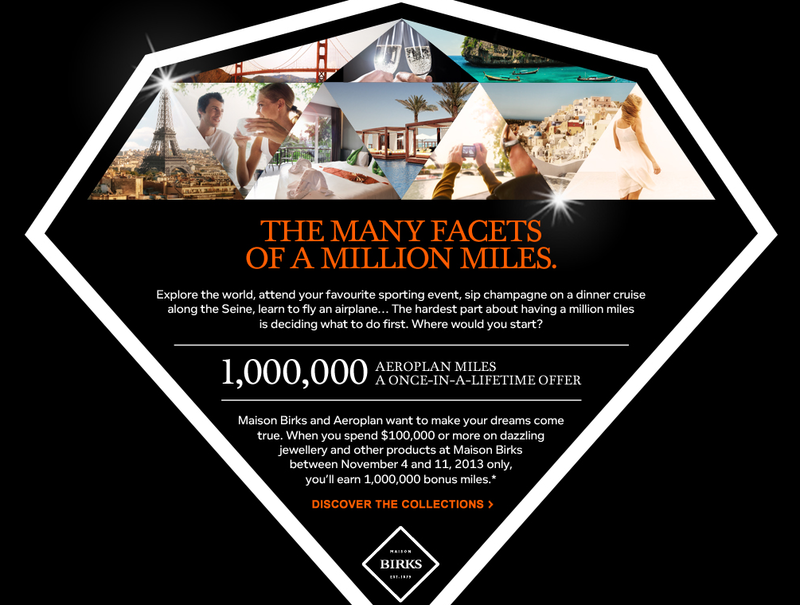 How do you get the million bonus miles? Oh it's simple! Its like spending pocket change for most us! No really, if you have $100,000 lying around to buy some jewelry from Birks then 1 Million miles is yours. Seriously? If you have $100,000 to spend on jewelry chances are you fly around in a private jet and On Million Aeroplan Miles isn't that big of deal or is it? If you value Aeroplan Miles at 1 cent a piece then you are a getting a 10% return on your $100,000 jewelry investment so perhaps those of you who are really rich and were planning a big jewelry purchase for Christmas this offer could actually bring you a healthy return. All you have to do is make that purchase of $100,000 by next Monday November 11th. Find all the details here.